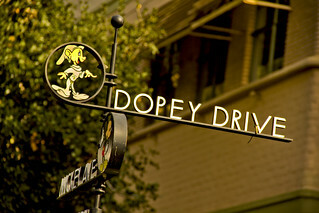 If you visit the Walt Disney Studios, don’t follow the street sign — it’s just a prop. It was added for the filming of 1941’s The Reluctant Dragon and became such an icon that it stuck around after filming and is still there today, but sorry, you won’t find the Layout Department on Dopey Drive. Great shot of one of Disney’s most famous corners! That and Casey’s. lol. Great shot! Sweet, I’ve always wanted to make a trip to see the studio but I never have.